Dead & Company has launched a digital concert series that will feature all 19 complete shows from the group’s fall/winter 2017-18 tour. The series kicked off January 10th with the digital release of all three of the original February 2018 “Playing In The Sand” shows, and in advance of the second annual “Playing In The Sand” all-inclusive concert vacation in Riviera Maya, Mexico next weekend, January 17-20th. Over the next two months, Dead & Company will release two more complete live shows digitally every week. The shows will be available through all digital download and streaming services. In addition, the concerts will be offered in Apple Lossless and FLAC formats from Dead.net. Live audio for these recordings was mixed and remastered by Dead & Company’s Front of House Engineer, Derek Featherstone, and the band’s Recording Engineer, Ross Harris. The digital concert series will lead up to the band’s 2019 Summer Tour, which will begin on May 31st at Shoreline Amphitheater in Mountain View, California, and finish on July 6th at Folsom Field in Boulder, Colorado. 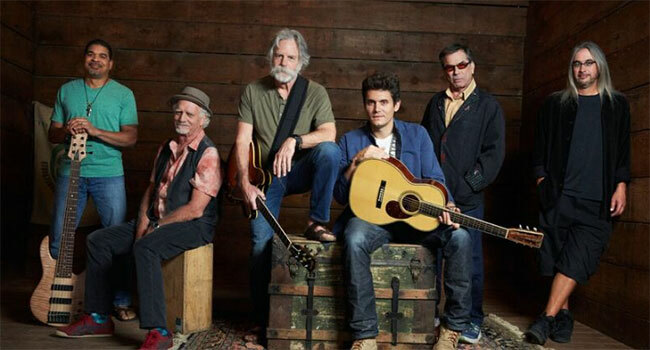 Dead & Company was formed in 2015 when the Grateful Dead’s Mickey Hart, Bill Kreutzmann and Bob Weir joined forces with artist and musician John Mayer, Allman Brothers’ bassist Oteil Burbridge, and Fare Thee Well and RatDog keyboardist Jeff Chimenti. The result was one of the most successful touring bands of the decade. The inaugural tour kicked off in the fall of 2015 with two sold-out shows at the legendary Madison Square Garden in New York City and ended with two sold-out performances at the “Fabulous” Forum in Inglewood, California.